Algae blooms. Coral bleaching. Dead zones. Economic crisis. These are just a few of the many serious consequences of polluting Earth’s waters. By educating ourselves on the types of ocean pollution, we are taking the first step to becoming aware so that we will be more empowered to take the next steps of conserving two-thirds of this planet on which we all live. Garbage and plastic debris (bags, straws, cutlery, six-pack rings, water bottles, etc.) is a huge threat to the survival of marine fauna. Trash is ingested, causes entanglement, and suffocates our ocean friends. Sunscreen, body lotion, insect repellents, essential oils, hair products, and makeup can all make their way into the water via the bodies of swimmers. These substances negatively affect algae, sea urchins, fish, and mammals in the ocean as well as coral reefs. While oil seepage from highly pressurized seafloor rock does occur naturally in some areas around the world, there are plenty of other ways humans are adding to the problem. Oil from vehicles on the road wash off and trickle into the ocean. Boats sometimes spill oil directly into the water. Of course, there are also occasional catastrophic oil spills. No matter how the oil seeps, it’s harmful to marine life. Sometimes our sewer and septic systems don’t operate properly or do not remove enough nitrogen and phosphorus before discharging our gray water into the waterways. The EPA estimates that 10-20% of septic systems fail at some point in their operational lifetimes. This can happen due to aging infrastructure, inappropriate design, overloaded systems, and poor maintenance. The resulting pollution comes from soaps and detergents, human wastewater, and solid sludge. Nitrogen-rich fertilizers and pesticides applied by inland farmers run off into the ocean through rivers after a rainstorm. Also, the aquaculture industry has been known to release uneaten food, antibiotics, and parasites from fish farms into nearby waters. Industrial waste is a huge issue when it comes to ocean dumping. Dangerous toxins that accumulate include radioactive waste, arsenic, lead, fluoride, cyanide, and many other high contaminants. This waste infects the water and sea life…including the ones that we humans eat! Eutrophication creates areas that can’t support ocean life. Eutrophication frequently occurs in coastal waters due to a lack of oxygen dissolved in the water and an excess of nutrients, mainly nitrogen and phosphorus. There are currently over 400 dead zones all over the world’s coastlines. The biggest concern is nutrient pollution that comes out with fresh water and into the ocean. This pollution comes from run-off from municipal and industrial wastewater treatment plants and industrial-scale agricultural farms. Carbon dioxide is produced by burning fossil fuels, and as the atmospheric concentration of CO2 gas increases (faster than they have in the last 300 million years), our oceans are becoming more acidic, since carbon dioxide dissolves into the water. This change in the pH of ocean water has disastrous effects on corals and shellfish. You may have not considered sound to be a pollutant, but take a moment to think about it. Many ocean species rely heavily on their sense of hearing. Noise that is generated by passing cargo ships, sonar, oil exploration and drilling, commercial fishing, recreational jet skis, etc. causes confusion and interferes with the acoustic information that is relied upon for survival of the fittest in the water below. In essence, pollution of the water is not any different than pollution on land or in the air. There are terrible ramifications. Thinking “out of sight, out of mind” doesn’t solve any problems and will only make things worse in the end. Now that we are a bit more educated on these nine types of ocean pollution, let’s work individually, and together, to figure out a way to clean up our mess and sustain our beautiful world. 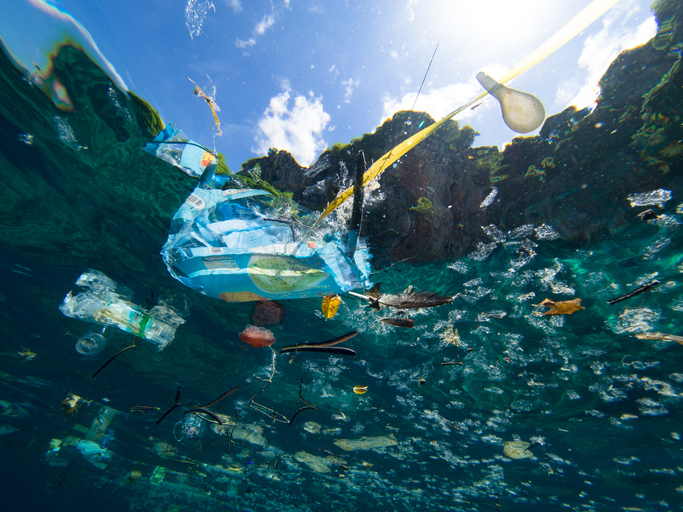 And remember, positively influencing our environment doesn’t just take place on an individual level – it takes communities, companies, and industries to make a difference and influence those around us to be more aware of how their waste affects the ocean.